1. Horse heaving is also known as broken wind, hay-straw allergy, or emphysema. 2. One of the most common causes of respiratory problems in horses is COPD. COPD in horses is most common amongst horses kept in a stable. As a matter of fact, eighty percent of stable-kept horses present with some form or another of respiratory inflammation. Be sure to keep a horse suffering from COPD out to pasture as much as possible. 3. 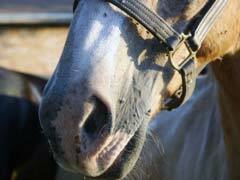 Mould spores are another common cause of problems in equine respiratory health. A horse that is continually exposed to dust and mould will eventually become very lethargic and have a runny nose. 4. Strangles in horses is a highly contagious condition that is most commonly seen in foals. If you see symptoms of strangles (fever, swollen glands, and nasal discharge), contact a vet immediately. 5. Any size or breed of horse can suffer from respiratory infections. Respiratory infection in horses is best avoided by keeping your horse in a well-ventilated area and letting it graze as often as possible. 6. Feed horses at floor level to help them clear mucous from their airways. 7. Any time equine respiratory health is compromised, hay should be taken out of the horse’s diet. Diagnosis and treatment of horse respiratory health issues require technology and medications available only to trained professionals. For that reason, you should always consult with a vet any time you feel your horse may be developing a respiratory health problem.